Whether sipping or stirring, our bar straws are a staple for the well equipped bar cart. 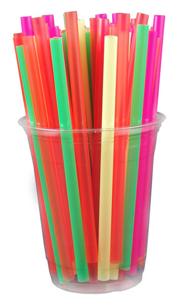 Our colorful bar straws are wider that most bar drink stir sticks. You can actually use them as a straw. They come in four assorted colors. Size is about 6” long and 3/16” diameter.